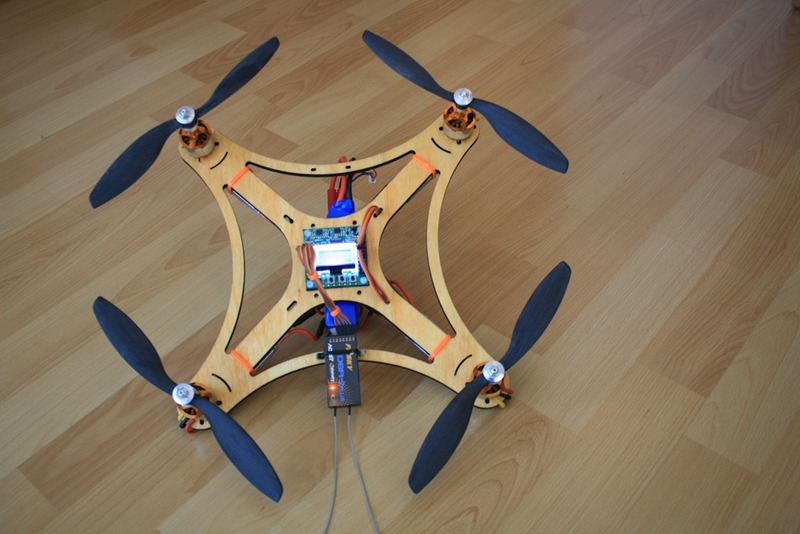 In my last article I described which parts do we need, so we can build a 300$ quadcopter. I will try to explain the building process as simple as possible. 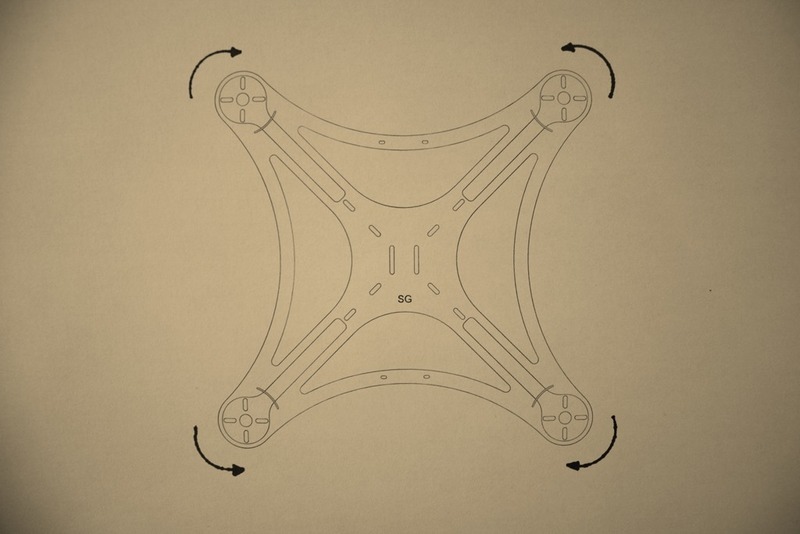 In this article I would not mention how to optimize your copter by eliminating vibrations, balancing props or tuning the PID settings of your flight board. In my opinion a beginner should start with the basics and then learn new things step by step. 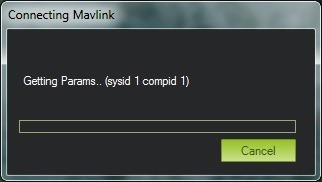 So let´s get started. 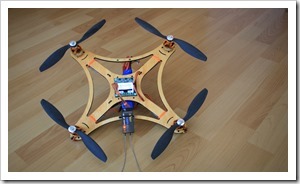 In my very first quadcopter I used the X525 frame from HobbyKing, but later I created my own frame. This one is made of plywood on a CNC-machine. If you bought the X525 frame you should start with assembling it first. An assembly manual is included in the package with it. 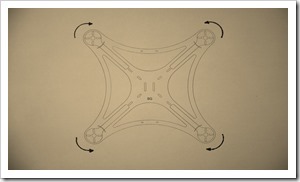 When you are ready with this step, then you should mount the 4 motors on it, without any attached propellers. 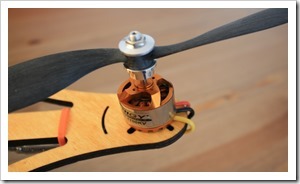 The Turnigy D2830-11 motors come with a mounting adapter, screws and prop-adapters. On the X525 you don’t need the mounting adapters and can easily mount the motors direct on the glass fiber motor mounts. 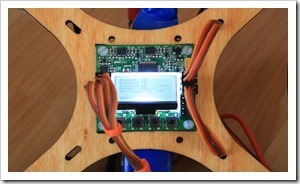 On the picture below you can see the motor on my actual plywood frame. On the second picture you can see it from the bottom side. Here we come to the next step: connecting the four ESCs with the motors. Every ESC has on the one side 3 cables (red, black and yellow) and on the other side 2 cables (red and black). 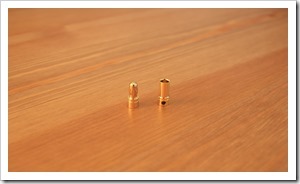 There is also a tiny cable which ends with a male-plug. 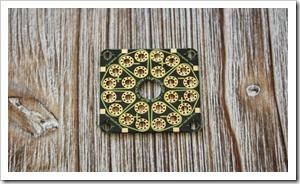 Please note that the ESC on the picture has no connectors on its cables. 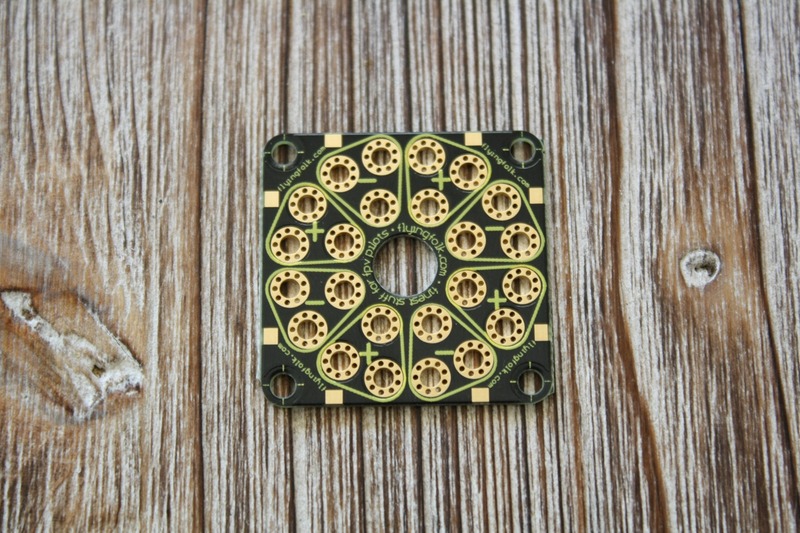 As I mentioned in my first article you can buy these 3.5mm gold connectors and solder them on the ESC. By two of the ESCs (either Nr.1 and Nr.3, or Nr. 2 and Nr. 4) you should reverse the red and yellow cables. This is because we want two of the motors to spin in counter-clock direction. I tried to illustrate this on the picture below. 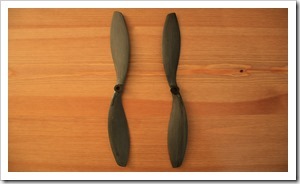 Propellers: The right one spins in clock direction, the left one in counter-clock direction. 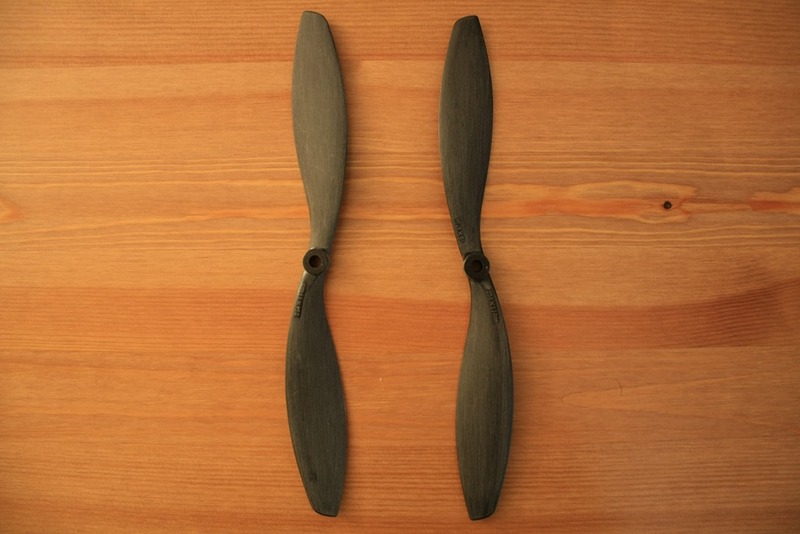 I had the problem as a beginner that, I didn’t mount the right prop on the right motor and so my quad either not take off or flipped. So take you time and do it right. 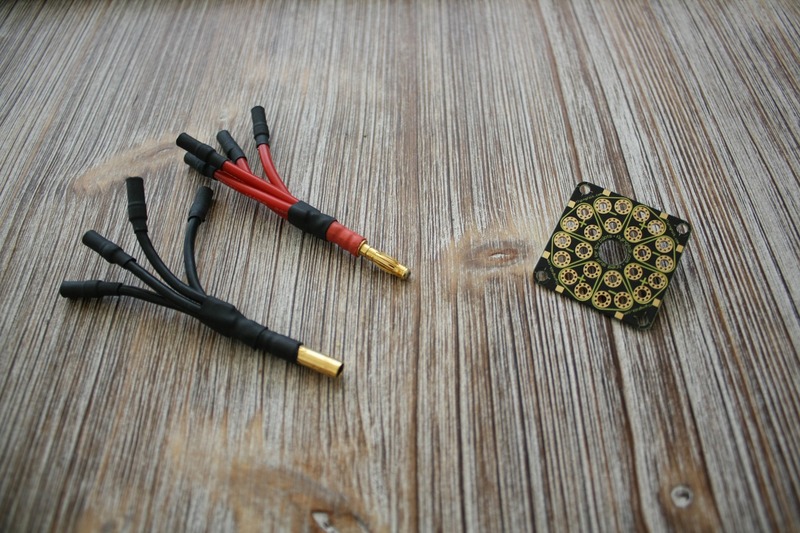 Next you should connect these tiny cables from each ESC to your flight board. 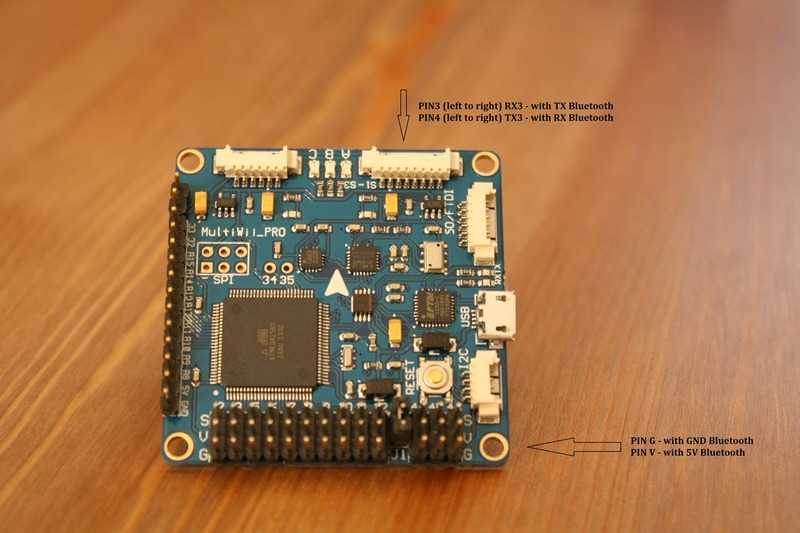 If you bought the KK 2.0 board or the newer one KK 2.1, you can check the next picture on how to do it right. The cable from ESC 1 (front left) comes on pin1, ESC 2 (front right) comes on pin2, ESC3 (bottom right) comes on pin3 and ESC 4 (bottom left) comes on pin4. The tiny-cables must have this order from left to right: yellow, red, brown. 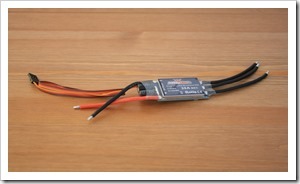 Then you should connect the other cables of each ESC to the battery. All 4 red cables to the red cable on the battery and all 4 black cables to the black cable on the battery. 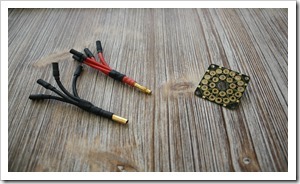 There are three ways to accomplish that: You have bought a power distribution board and solder the cables on that one. Or you bought a power breakout cable…or you make yourself one. 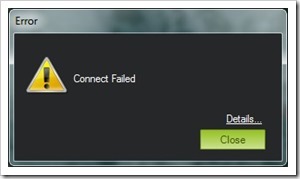 Once you have done this, you should connect the receiver (RX) to the board. 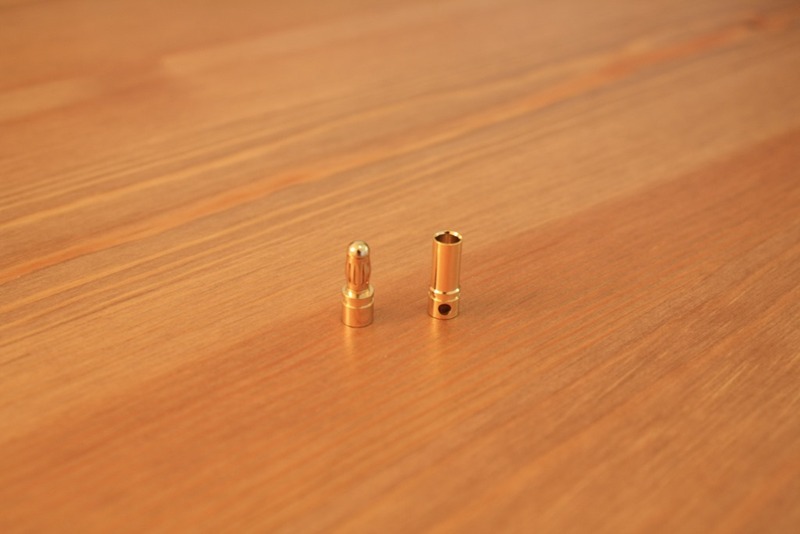 On the KK2.0 and KK2.1 the receiver-pins are on the left side. 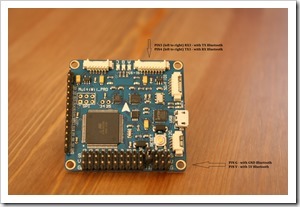 You need at least a 4-Channel-RX for a quadcopter and if you are using the KK board it is good to have a 6CH or more. When connecting the cables to the board, beware: from right to left: yellow, red, brown. (Brown for ground, red for VCC and yellow for signal cable). 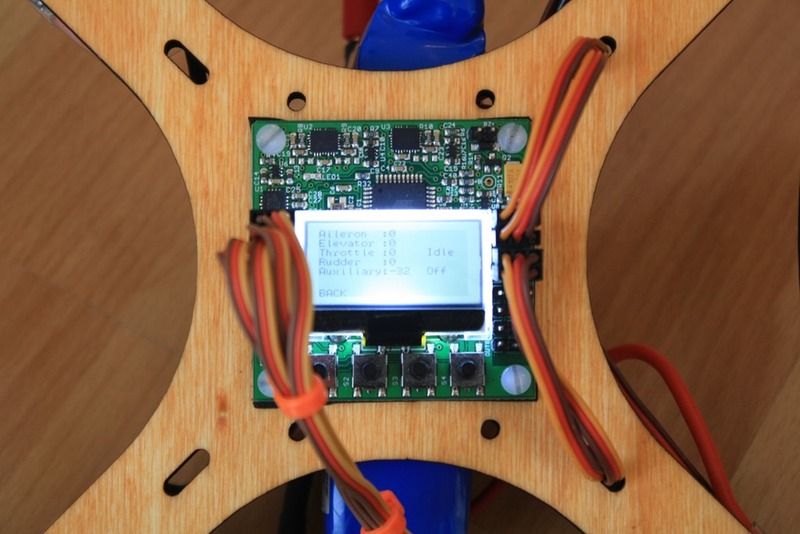 If you want to test, if all the cables are right connected go to the “Receiver Screen” on your KK board and do this: Move the sticks on your Transmitter (TX) and see if it is right indicated on the screen. 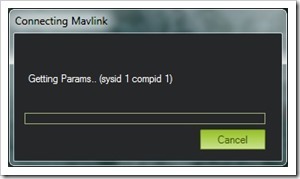 Probably you should also reverse some of the channels on your TX to do it working properly. So if everything is connected the right way you can try to make your first fly. 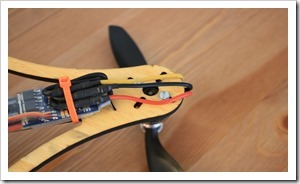 To do this you need to “ARM” your flight board. 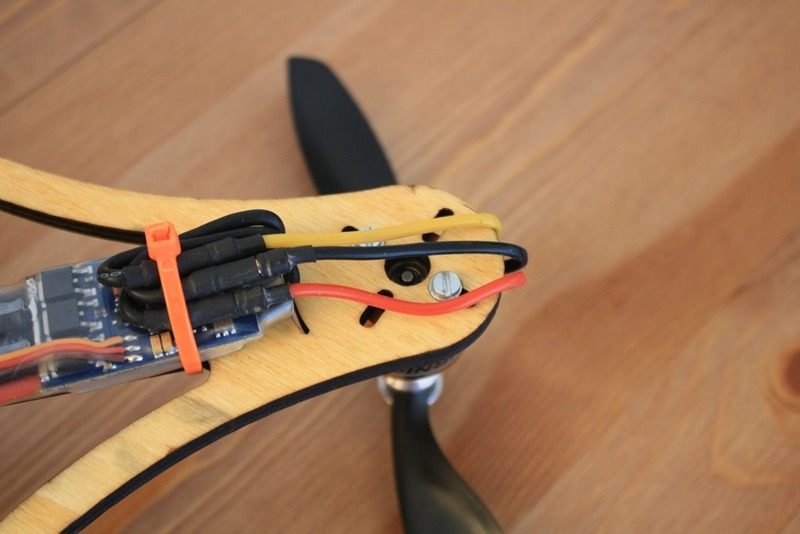 Move the Throttle-Stick on your transmitter down and right and hold it for a few seconds and then release it. In this case the board should indicate “Armed”. Now move your throttle stick very slowly so the motors start spinning. Then move it again very carefully and observe the behavior of the copter. 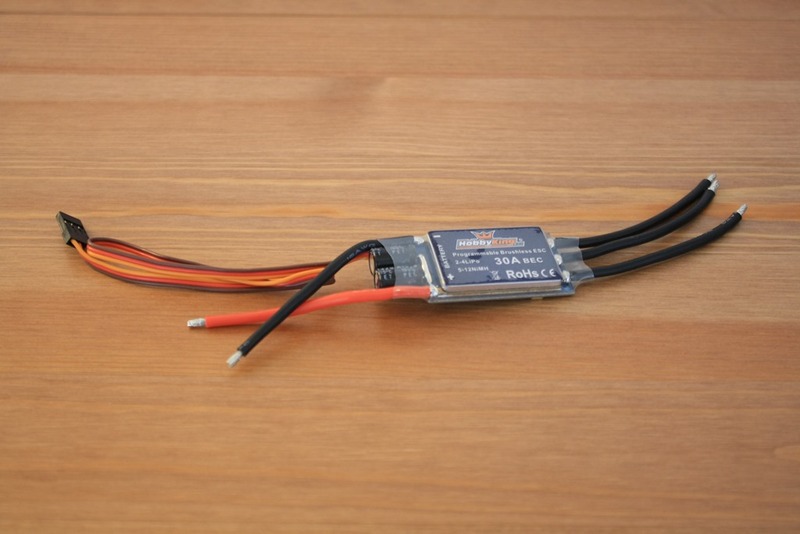 If you have problems such as not taking off or flipping, as said you had mounted the props wrong or connected the yellow and red cables of the ESCs wrong. If so, “disarm” your copter by moving the throttle stick down and left for a few seconds, so the KK board shows the “Safe” screen. 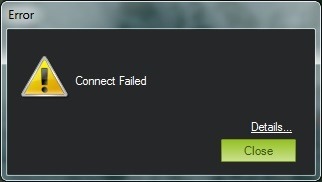 Then try to fix the problem and try again. If you cant solve the problem, you can either search on google or comment here. At the end: Beware, these machines are not toys, they have a lot of power and can heart people. Be careful when flying and have fun. If you find my article useful, please click on the buttons below to share it. Thanks! 02.06.2014 Update: Here you can see my new build with the “SG Adventure” carbon frame.